E.C.S. 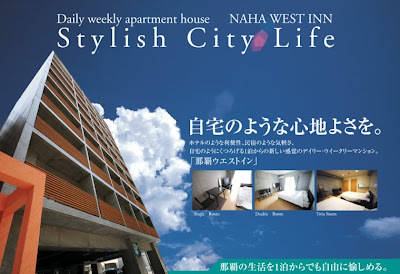 Japan (English Communication Services): Need a place to stay in Naha? While my friend Richard was doing his Genki English (http://www.genkienglish.com/) yearly workshop here on Okinawa, he stayed at the Naha West Inn in Naha. Not your ordinary hotel but rather an apartment hotel. It was really cozy and very stylish. It includes Internet access as well as a flat screen TV. I liked the fact that it is a gated hotel that offers the feeling of security. There is even a restaurant on the 2nd floor. I was mildly surprised to find out that it is very affordable at only 4500yen a night for a single bed apartment. This would be great for all the JETs that are attending the Mid-Year Conference that need accommodations. I highly recommend this place! Thanks to Richard for introducing this place to my fellow bloggers. Here is more info on Naha West Inn. http://78west-inn.jp/ Check it out!